There are a lot of delicious peanut butters out there, but not as many good jams. So I'd like you to imagine an incredibly tasty jam—a jam that is made simply of fruit and a touch of sugar. But here's the thing—you do! It's as easy as grabbing a bag of frozen berries, adding a tablespoon of sugar, and cooking for only 15 minutes. And if you want to combine this amazing new jam (that you made!) with some peanut butter and hemp seeds on your favorite bread, you suddenly have a seriously awesome lunch for yourself! 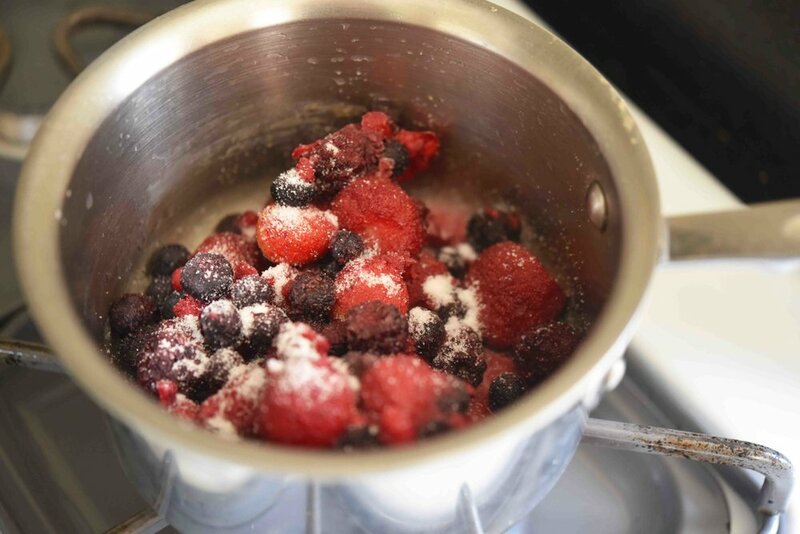 In a small saucepan over high heat, combine the frozen fruit, 2 tablespoons of water, and the sugar. Bring this mixture to a high simmer, stirring occasionally and breaking up the fruit with a spoon. Continue cooking the fruit mixture over high heat, stirring occasionally, until the mixture is thick enough to leave trails in the pan when stirred—10 to 15 minutes. Remove the pan from the heat and allow it to sit for 10 to 15 minutes, then transfer the fruit mixture to a small bowl. Place the bowl in the refrigerator for at least 30 minutes to allow the jam to set and chill. Spread one slice of bread with the peanut butter, then sprinkle it with the hemp hearts. Spread the Quick Frozen Fruit Jam onto the other slice of bread, then sandwich the two slices of bread together. The ¾ cup of jam yielded by the Quick Frozen Fruit Jam can make 6 sandwiches. You can omit the sugar if you prefer; the jam will still be super tasty. If you use tarter fruits, such as cranberries, you may need more sugar.